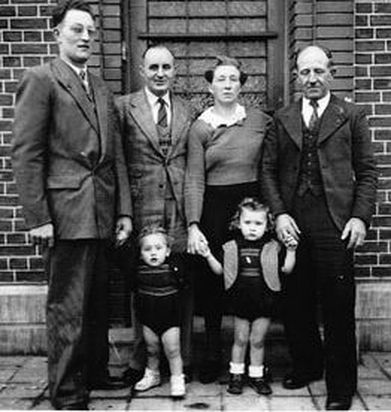 Creton Family - THE MASSACRE AT LE PARADIS - HELL IN PARADISE - MAY, 1940. Two of the central characters in our story are actually farms owned by the Creton Families. The first farm where the massacre occurred was owned by Louis Creton. The second farm was the home of an outstanding French family the Duquenne-Cretons who showed incredible bravery in risking their lives to hide Privates Bert Pooley and Bill O'Callaghan. The image below shows the path of the massacre from its start at Duriez Farm where the Norfolks and other regiments made their last stand through to the field and road where the prisoners were searched and had most of the belongings they were carrying taken away and onto the massacre outside the barn at Louis Creton's Farm. 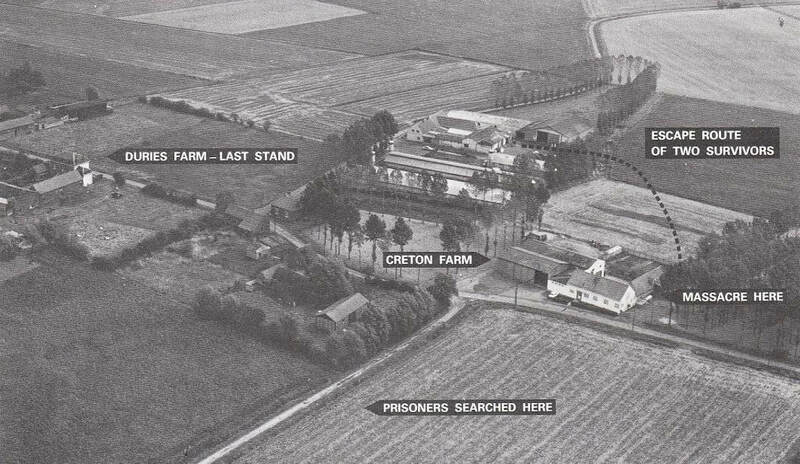 It also shows the path taken by the two survivors with Bill O'Callaghan carrying Bert Pooley as far away from the massacre site as possible and to the relative safety of outbuildings owned by the Duquenne-Creton family. At the time of the massacre in May, 1940, there were very few buildings in a very rural landscape bordered on all sides by fields and open countryside. The barn owned by Louis Creton formed the macabre backdrop for the massacre with the 99 soldiers and their German captors. This horrific photograph which is now frozen in time was taken by photographer Herbert Brunnegger who has his own section on this web site. The image below was taken a matter of minutes later after the massacre had taken place. The following two photographs show the mass grave at the barn and local people tending it. In the photograph below the work to exhume the bodies is underway. Dennis O'Callaghan remembers the hospitality afforded to him on his visits to Le Paradis and the Creton Farm in particular: "On my early visits to Le Paradis, I was always treated to drinks in the farmhouse by Victor and Madame Creton and also given bottles of pink champagne to bring home for my mother. This is where my father used to stay with them on his early visits to Le-Paradis. I believe Stan Priest would drop him off here and collect him after a few days as Stan spoke French ." The "sanctuary" farm was owned by Madame Duquenne-Creton and her son, Victor. After finding Bert Pooley and Bill O'Callaghan, they risked their lives to bring food and drink to the two men. Anybody deliberately found to be harboring Allied troops risked being killed by the Germans. Thankfully they were spared and, with the agreement of the two British soldiers, handed them over to the Wehrmacht’s 251 Infantry Division. 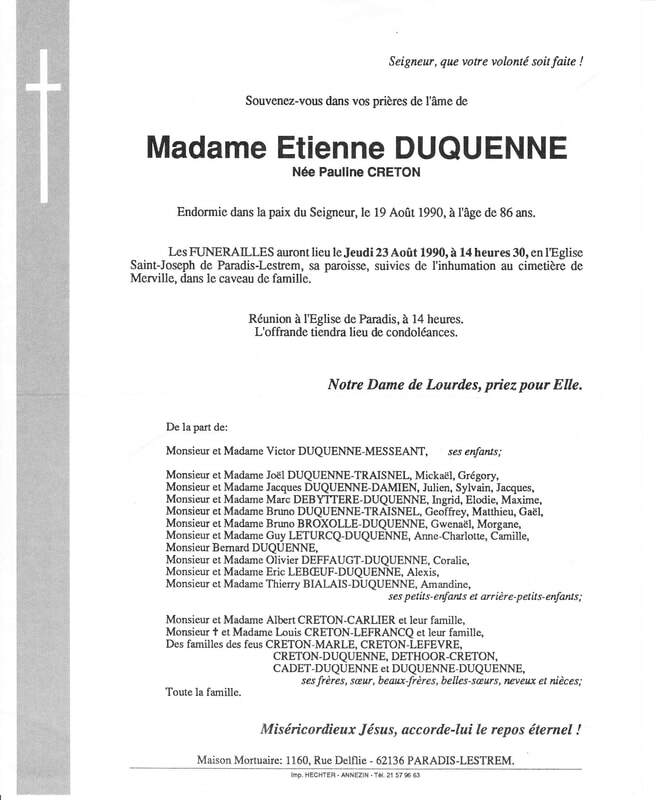 At the time of the massacre Madame Duquenne-Creton's husband Etienne was serving with the French army and so she ran the farm with the help of Victor who was aged just 11. Louis Creton, who owned the massacre farm gave a written statement to the trial of Fritz Knoechlein. Madame Creton, who was born in 1904, died in August, 1990. Below is her funeral notice. Above shows Victor Creton, Mr and Mrs Bill O'Callaghan, Pauline Creton and Heather O'Callaghan pictured at the reunion in Norwich in the 1960s. On the right Bill O'Callaghan is re-united with Victor Creton, Pauline Creton and Etienne Creton in France. Before her death Madame Duquenne-Creton met up with Bill O'Callaghan on a number of occasions both in France and England. Bill made a number of pilgrimages to France and Madame Duquenne-Creton and Victor travelled to Norwich in 1964 to meet the man they had found in their pig sty. "At the time of the events in May, 1940, I evacuated my home on 20th May, in order to flee from the advance of the German army. On my return on 2 June, 1940, I ascertained that a communal grave surmounted by a small cross had been dug in one of my meadows near my farm. I also noticed bullet marks on the stable wall facing onto the meadow at man's height. By the wall bits of brains and pools of congealed blood were scattered on the ground. At a distance of about 25 metres from the wall mentioned I found a pile of about 200 German cartridge cases. I learnt then from M and Mme Dieu that 97 British soldiers were shot by Germans belonging to the unit which had occupied the village. After making enquiries, I believe that nobody could have watched the shooting. All the same the Dieu couple as well as a woman by the name of Therese Zielinski might have seen the Germans carrying out the disarming of the 97 British soldiers in a field facing the meadow; that would have been some time before the execution. The equipment remained in that field for several months. In 1942 I was present at the disinterment of the British soldiers and I noticed that many of the bodies still had bandages on them, either on their arms, legs or head; one of them still wore a dressing on his arm showing that this limb had been fractured. I would add that when I returned from my evacuation on 2 June I found several buckets of blood and human brain which proves that the British soldiers had been shot from very close range." A photograph of the above statement can be found in our section on the trial of Knoechlein.